Construction company, Woodhead has been working in Lincolnshire for many years. Its Lincoln city centre office has doubled the size of its team over the past 12 months, as they continue to deliver a wide range of projects across the county. Woodhead has delivered a number of projects for schools and educational establishments across Lincolnshire, including the University of Lincoln, Lincoln College and Bishop Grosseteste University. The company has also carried out construction projects for the City of Lincoln Council, South Kesteven District Council, North Kesteven District Council and West Lindsey District Council – a number of which were procured through the empa ii (East Midlands Property Alliance) Framework. Its specialist heritage and conservation team, Woodhead Heritage, has delivered the Lincoln Castle Revealed programme of works, which included the new build construction of the subterranean Magna Carta Vault, in time to celebrate the 800th anniversary of Magna Carta. 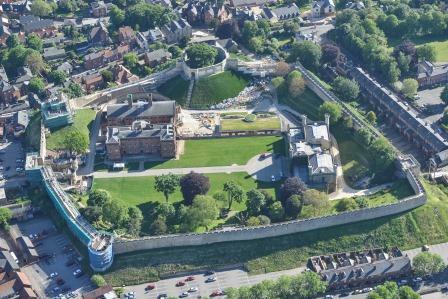 Lincoln Castle Revealed has already won a raft of awards, including heritage titles at this year’s RICS (Royal Institute of Chartered Surveyors) Awards, National Federation of Builders, CIOB (Chartered Institute of Builders) and Construction Excellence Awards. In celebration of the part Woodhead Heritage played in this landmark project, the company decided to support this year’s Magna Carta category at the Lincolnshire Media Education Awards. Juliet Slater, team leader for the Lincoln office, said: “We have a dedicated team supporting all our Lincolnshire projects. We have grown exponentially thanks to the quality of the projects we’ve delivered, resulting in repeat orders and new customers who want to work with us.